One GIANT gift book for children who like their literature to be spectacular. 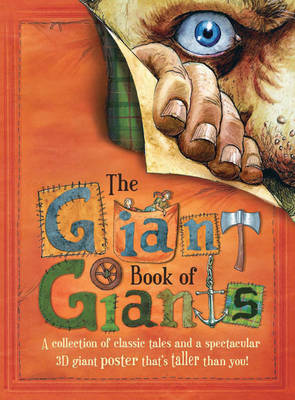 Enjoy a collection of classic giant tales and a spectacular 3D giant poster. Be brave and dare to enter the realm of the giants . . . This enormous collection features giants from all over the world. From Jack and the Beanstalk to sailing the Seven Seas with Sinbad, meeting the curious Giantess to helping Coyote, Momotaro and Finn McCool rid their people of ferocious giants. Now take a deep breath, and pop open the giant 3D poster . . .
Meet a mighty giant who has come to stay with you. Don't be scared though, this is a gentle giant who will guard your room. Hang him on your wall and discover how he collected a treasure trove of secrets.